Known as a top diving site in the Yucatan Peninsula, Cenotes Dos Ojos (Two Eyes Cenote) boasts about 300 miles (483 kilometers) of connected underwater passageways, creating a natural cave system. Divers can explore its nearly 7,000-year-old caves and underground rivers. It also contains the deepest-known cave passage in Quintana Roo. Located north of Tulum and south of Playa del Carmen, Cenotes Dos Ojos is a popular excursion for those visiting the Mexican peninsula. The water temperature is considered optimum for snorkeling, at roughly 77°F (24°C) throughout the year. A range of tours offering scuba diving, snorkeling, and sightseeing options are available and typically depart from the major resort towns. Visitors can also simply float in the clear blue waters, taking in the rocky stalactites and stalagmites. Some tours provide lunch, but bring food if you travel on your own because restaurants are scarce. Dos Ojos is open 8am–5pm everyday; toilets and changing facilities are available on site. Divers typically complete two dives, including one in the “bat cave,” home to plenty of the critters. Located off of Highway 307, Cenotes Dos Ojos is 31 miles (50 kilometers) from Playa Del Carmen, 10.5 miles (17 kilometers) from Tulum, and about 35 minutes by ferry from Cozumel. Most tours provide round-trip transportation from these major resort towns, as well as the proper gear. The cenote is also accessible by car or taxi; if traveling on your own, snorkeling equipment is available for rent nearby. The best months to visit the region are April, May, and November, which also means you encounter the biggest crowds during those times. Since the waters of Cenotes Dos Ojos remain around 77°F year-round, you can visit anytime and still enjoy a pleasant experience. If you plan to scuba dive and snorkel elsewhere, April and November offer the best visibility. Along with a visit to Cenotes Dos Ojos, some tours incorporate a stop at the nearby Coba ruins. The ancient Maya ruins, located about a 45-minute drive from Tulum, were home to 50,000 inhabitants at its peak. There, you can climb the main pyramid, Nohoch Mul. At 137 feet (42 meters), it's the tallest on the Yucatan Peninsula, and it provides panoramic views from the top. Experience the Yucatan Peninsula’s beautiful Dos Ojos Park on this all-day excursion. Dive, swim, or snorkel, and spend the day exploring this flooded cave system’s clear waters. Search for amazing rock formations, admire sea corals, watch for birds, wildlife and butterflies, and enjoy a once-in-a-lifetime journey through one of the world’s longest underwater caves. Explore the history of the ancient Maya civilization with a visit to the archaeological site of Tulum and learn more about the former city and its landmark monuments. Then refresh at the most famous 'cenote' in the area: Cenote Dos Ojos.One of the last cities built by the Mayans on an express 1-hour tour of the archaeological site of Tulum. Discover the remains of ancient buildings, such as the pyramid temple of El Castillo, the Temple of the Frescoes and the Templo Dios del Viento (Temple of the God of the Winds).Get approximately 1 hour to explore on your own and take in the views of the Caribbean Sea. Get some free time at the beach in Tulum. After, take a quick stop at cenote 2 OJOS, where you will be able to refresh yourself with a swim at this natural sinkhole. This tour is ideal for those that wish to enjoy 3 musts of the Riviera Maya, with very short traveling distances and all your needs taken care of: ** Explore the crystal-clear waters of the world-famous cenotes Dos Ojos where the Imax documentary "Journey into amazing caves" was shot ** Experience a private open fresh water cenote only surrounded by jungle ** Kayak in a private fresh water lagoon only surrounded by silence, mangroves and local fauna (individual kayaks are subject to availability) ** Delicious authentic Mexican lunch in the oldest restaurant in Tulum opened 60 years ago and still run by the same family (5 menu options to choose from). A fortress on top of a bluff overlooking the Caribbean Sea — visit Tulum in Playa del Carmen on this wallet-friendly half-day trip from Cancun. Learn the history behind the ancient Maya temple ruins during a guided tour, and then stroll the grounds and soak up the dramatic views of the sparkling turquoise waters below. Bonus: air-conditioned hotel transport is included on this early morning tour. Combine visits to the ruins of Tulum and Cenote Dos Ojos on a single tour from Cancun. Planning both of these activities on your own could be complicated, and would require a car rental—but this tour includes all transportation and the itinerary planned in advance. Explore the two neighboring cenotes, connected by a large cavern, via snorkeling, then head for the ruins of Tulum. All activities are accompanied by in-depth guided commentary. Snorkel in Dos Ojos cenote and visit the Tulum archeological site on a full-day, small-group tour with round trip transport from Cancun. This convenient, two-in-one tour explores the natural world and Maya history, and includes hotel pickup and drop-off, all entrance fees, snorkel equipment, lunch, and time to independently explore Tulum. Tulum is home to dozens of beautiful cenotes and caverns, many of which provide excellent diving experiences. Embark on two dives at different locations on this 5-hour guided tour. Transport, equipment and snacks are all included, making this day hassle-free. Enjoy personalized attention on this small-group tour limited to just 4 divers. Note: You must show a diving certification to participate in this outing. Experience the astronomical effects of light and shade on El Castillo, aka the Temple of Kukulkan, during the fall equinox. Take part in this phenomenal event and watch the descent of Kukulkan, or the Feathered Serpent, down the pyramid steps. After a tour of the World Heritage site, go for a swim in X-Cajum Cenote and have lunch in Valladolid. Note: This tour only runs from September 20–22. Descend to the mysterious depths of Dos Ojos cenote on a 2-day scuba diving tour of the Riviera Maya from Playa del Carmen. Over two days, you’ll experience four dives with qualified diving instructors. Witness the diverse marine life of two reefs and then, on the second day, venture deep into the jungle to explore Dos Ojos cenote, a glimmering natural pool famed for its distinctive limestone caverns. Accommodation is not included on the tour however pickup and drop-off at your Riviera Maya hotel is part of the package. Explore two Mexican cenotes, Dos Ojos and the Bat, on this guided all-day scuba diving tour. Basic certification is required in order to dive, but the clear, shallow waters are ideal for beginner divers. Plus, a professional team of tour guides and diving instructors will be on hand to offer instruction. 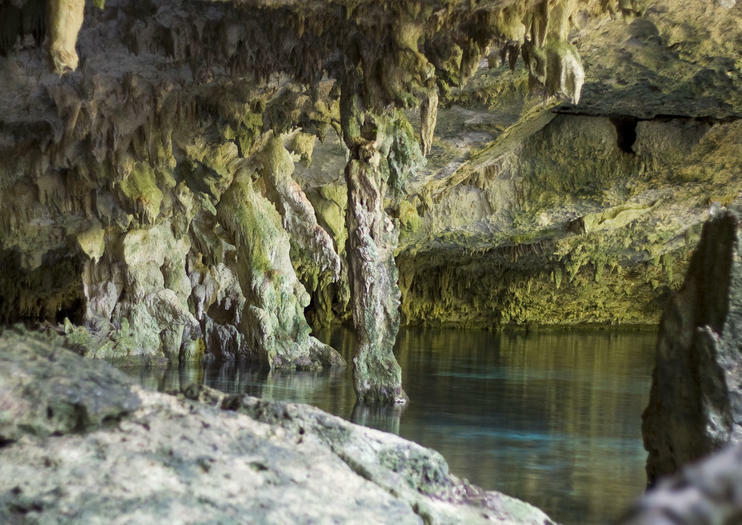 Inside the cenotes, view the stalactites, stalagmites, and flying bats. Go snorkeling in the warm waters of two different cenotes during a full-day tour from Playa del Carmen. Your guide shares the history of the Maya on the way to the two cenotes: Chikin Ha and Casa Cenote. Receive snorkeling instruction and gear to use at each cenote. The cenotes feature distinct aquatic life and scenery, and your guide provides commentary about their ecology. Discover the Yucatan Peninsula’s unique natural landscape away from the tourist crowds on an early morning, private tour of Dos Ojos. Snorkel in the 2 cenotes under the guidance of a certified instructor and learn more about the underwater rock formations, before heading to a local Mayan restaurant for lunch. Relax after an active excursion with hotel pickup and drop-off included in the price. Enjoy a full day of diving in two most interesting and beautiful Cenotes in Mexico: Dos Ojos and the Bat. With its amazing stalactites, stalagmites and flying bats it will make you feel like you traveled million years back in time. Incredibly clear and at the same time shallow water will give you an amazing opportunity to try yourself in diving without any serious training (basic certification is required). The professional team of tour guides and diving instructors will make sure you get the best experience out of this tour. Come join us in this unforgettable journey of exploring the old caves and take the first step into the underwater world.